Akkineni youngster and handsome hero Akhil's third outing as hero Mr Majnu is arriving today in theaters. Directed by Venky Atluri of super hit Tholiprema fame, there have been positive vibes around Mr Majnu touted to be a new age romantic entertainer with Nidhi Agerwal as heroine, bankrolled by BVSN Prasad. 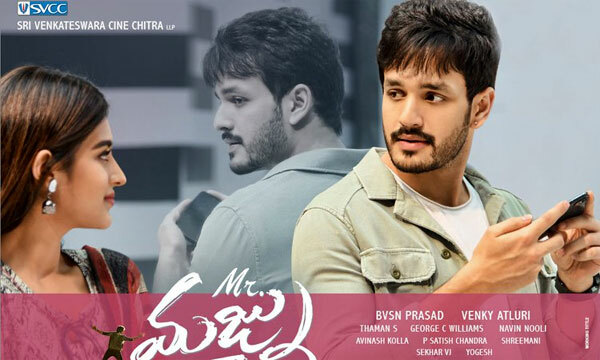 Post the release of Mr Majnu trailer, expectations grew manifolds… thanks to top notch styling for Akhil and his Casanova characterization have hit right chords. SS Thaman’s musical album is also filled with chartbusters. All these have helped Mr Majnu to become the best release after the slowed up Pongal hungama. Here comes Mr Majnu live review updates for our viewers. - Nidhi Agerwal introduction with pelli choopulu episode. - Akhil's introduction after females protest in support of him at his educational institution. - Title song- Mr Majnu. Akhil dances are a treat to watch. - Akhil, Nidhi's first meet at airport. - Akhil's Doberman philosophy is interesting and funny. - 1st fight, Akhil shows his frustration on Ajay's batch, after an emotional family sequence. - Akhil's lecture to his brother, too emotional. - Second song Chiru Chiru Navvulu - Akhil's sisister wedding. - Nidhi proposes to Akhil. They come to 2 months agreement. - Intermission. So far so good with light humor, family emotions and romance. - 2nd half begins with Emito song. - Hyper Adi as head of Hyderabad Rockerz, a piracy website. - Things going at slow pace. - 12 Time for a fight. - Hyper Adi's imitation of senior heroes, just okay. - Time for another song Kopamgaa. - An action episode meant to unite Akhil and Nidhi. - Climax- Patch up at airport. Injustice to Fathers: Radha Inspired by Balayya? Manikarnika: Who'll Be The Winner?